I'm giving away five free copies of my novel on GoodReads.com. Details below. 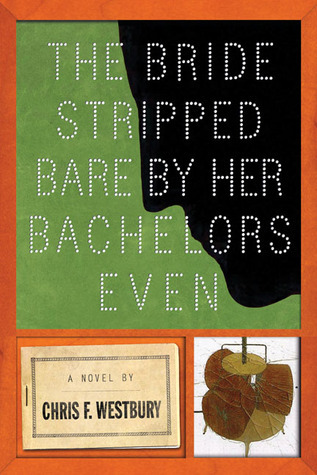 My novel The Bride Stripped Bare By Her Bachelors, Even went to press yesterday. Here is the final cover, designed by Michael Kellner. I love the design: it captures the quirky, off-beat feel of the story and pays homage to Duchamp in many different ways. enough to live for a while on but not really a lot. One of the main characters in my novel, Greg, is writing a book based on his master's thesis, called Bear-breed Spirit Depth: Duchamp, semantic multiplicity, and the artistic life. The first part of his title is an anagram for The Bride Stripped Bare. That's Greg for you. Greg's book plays no role in my plot, so there is nothing in my book to say what it contains. The thesis is about the bizarre flexibility of meaning. Greg points out that one lesson from Marcel Duchamp's work is that the meaning of objects is not contained only in those objects. Meaning diffuses outward from any thing, from any set of things, to new times, spaces, and concepts. A (copy of a) nearly-worthless (possibly entirely imaginary) typewriter cover in Paris, France one day is a renowned and highly-valued piece of art history in the National Gallery of Canada a few decades later. Greg edits and writes very slowly. He feels no need to ever finish writing the book. 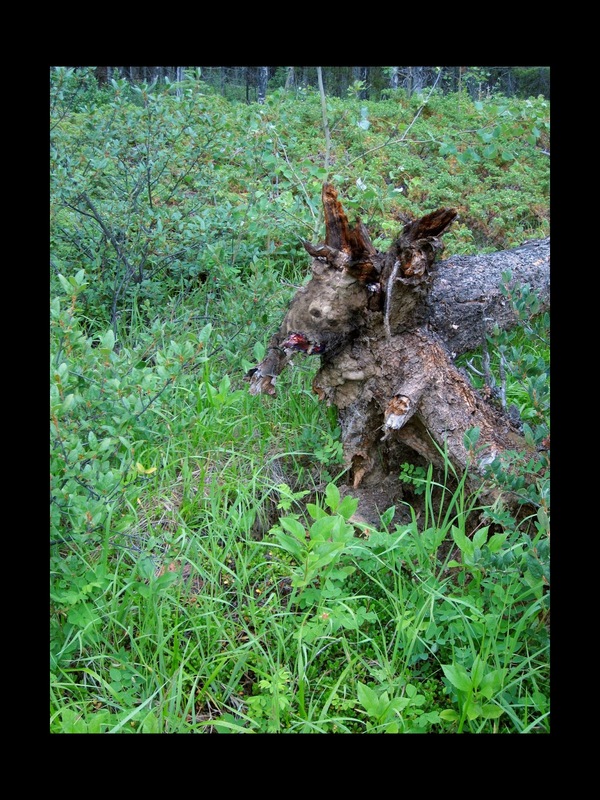 He is happy to spread his delight in working on Bear-Breed Spirit Depth across decades. 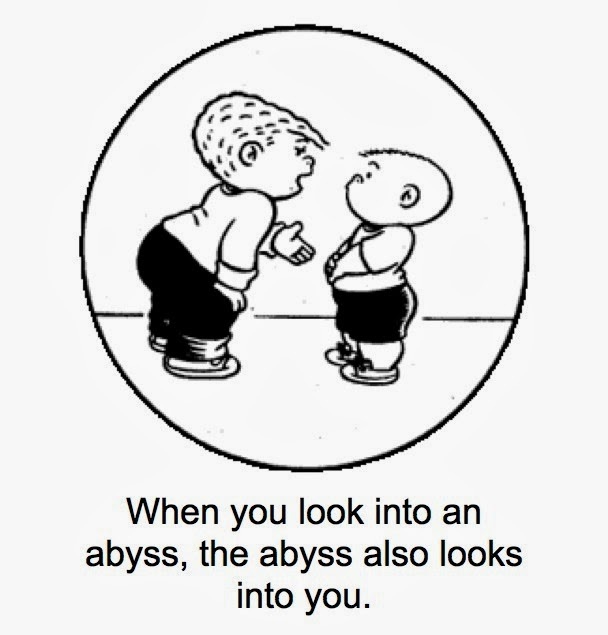 I am very fond of the The Nietzsche Family Circus, which pairs random Family Circus cartoons with random quotes from Nietzsche. Highly recommended. Perhaps one of Marcel Duchamp's most obscure pieces is his Door, 11 rue Larrey. 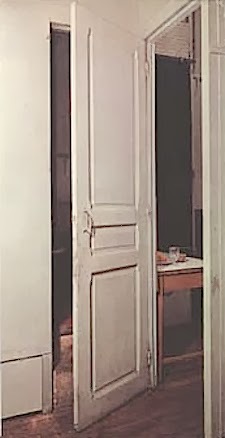 This was a door that that Duchamp had a carpenter construct in 1927 in the corner of a room in Duchamp's apartment. Because of this location, the door closed one entrance when it opened the other, thereby contradicting the French proverb Il faut qu'une porte soit ouverte ou fermée ['A door must be either open or closed']. You can read more about Door, 11 rue Larrey here on www.toutfait.com. I enjoy reading and re-reading Emil Cioran, the Romanian/French 'philosopher of despair'. Although he is certainly not as funny as Samuel Beckett (whom Cioran knew quite well) and not as open to the possibility of grace as Simone Weil (whom Cioran apparently never met), he shares that lightness of being that goes along with a deep appreciation for "the inconvenience of existence" (his own term). Here's a sampler of his work. The intrinsic value of a book does not depend on the importance of its subject (else the theologians would prevail, and mightily), but on the manner of approaching the accidental and the insignificant, of mastering the infinitesimal. A moment comes when it seems futile to choose between metaphysics and amateurism, between the unfathomable and the anecdote. I shall be reconciled to myself only when I accept death the way one accepts an invitation to a dinner: with amused distaste. A book should open old wounds, even inflict new ones. A book should be a danger. The only explanation for the creation of the world is God's fear of solitude. In other words, our role is to amuse our maker. The dead center of existence: when it is all the same to you whether you read a newspaper article or think of God. No man of vice can be condemned unless he ceases to look upon vice as a pretext and turns it into a goal. One of the great delusions of the average man is to forget that life is death's prisoner. 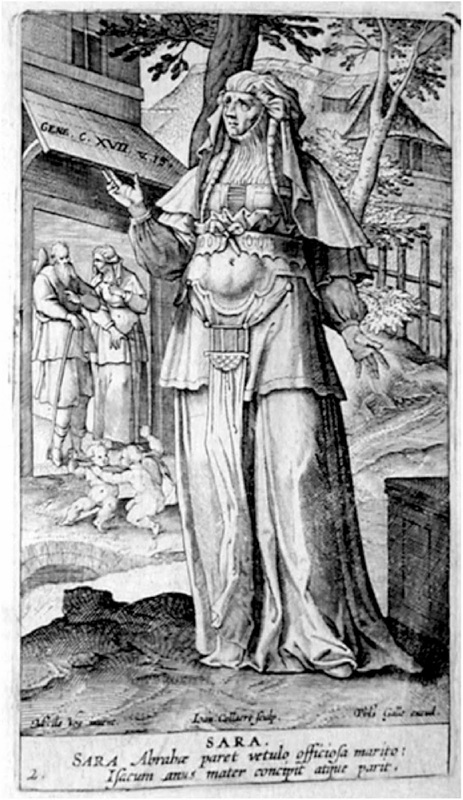 I love this very odd image of Sarah, Abraham's wife and Isaac's mother, by the Flemish engraver Hans Collaert (1545–1628). This image is mentioned in passing in my novel The Bride Stripped Bare By Her Bachelors, Even, which revolves in part around the story of Abraham and Isaac. I just cannot figure out what she is wearing, but I think it is a fashion faux pas. Call me a moderne, but I'd cover that belly, pull up the front of the dress, and not wear squares on my breasts.